This one bedroom, one bathroom Condo comfortably sleeps up to four adults. It offers all of the amenities of home. Even an Xbox 360 and a few games! Overlooking the River Run Village with slope-side views of Keystone Mountain. Enjoy your stay in Keystone's River Run Village, right in the middle of all of the action. Located at the Silver Mill Lodge, this fourth floor Condo is just a short walk to lifts, shops, bars, restaurants, festivals, and much, much more! This one bedroom, one bathroom condo comfortably sleeps up to four adults. It offers all of the amenities of home with excellent mountain views on its private balcony patio. When you arrive you will park your car in heated/underground parking right below your condo. Luggage carts are available to assist you in unloading your car. There is a private locker on the ground level for your skis and other outdoor equipment. You can also enjoy the sauna, newly installed hot tubs, and heated pool just a few steps from the building. There is even a new fitness center in the building. There is no better location in all of Keystone! Well appointed and comfortable, this one bedroom condo has great upgrades and personal touches, right down to the stone light switch plates. 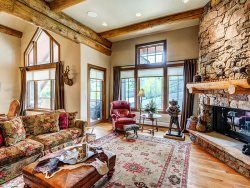 The living room has very comfortable leather furniture, perfect for gathering after a long day on the slopes in front of the gas fireplace. The new 32" flat screen TV has a DVD player and a VCR (small collection of VHS tapes available). The fully equpiied kitchen is perfect for cooking all meals at home, and the dining room table will seat up to 5 people. This condo boats breathtaking views of Porcupine Mountain and the mountains towards the east. The bedroom features a cozy queen size bed with new quilt bedding and a TV. The bathroom has a pedestal sink and a shower/tub combination. This is and ideal place for small families, couples, or friends. You won't be disappointed with this location!